Shop online for 2 miliscale plastic models at discounts up to 46%. 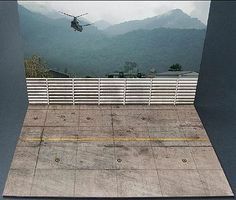 This is the South East Asia Airfireld Set Concrete Hardstand & Typical US Airbase Backdrop Plastic Model Aircraft Accessory by Miliscale. This is the 1/72 Scale WWI Airfield Set Grass/Flagstone, Summer & Winter Backdrops Plastic Model Aircraft Accessory by Miliscale.